As a bicyclist who uses the Chester Valley Trail regularly, at times it is difficult to maneuver around runners, kids, walkers and the dogs. The trail is absolutely no place for off leash dogs. Period. This article reminds me of those angry at the “Quiet Car” on Septa. If one wants to be noisy and talk on their cell, etc., there are 4-6 other cars, where they can do that. Sitting in the quiet car & then being angry you can’t talk is ridiculous. Hanging out at a leash-free park & then complaining there are dogs there is silly. There are many, many parks, whereby dogs must be leashed. Those parks are for you. Enjoy and enforce the rules there. Leave the very, very few leash-free parks to the dog owners. Harford Park in Radnor is the perfect example of an excellent leash-free park, but it’s not a place for small toddlers or those afraid of dogs. Interesting comment. Teegarden Park has a children’s playground area and picnic area – so is your suggestion that township residents with small toddlers or those of us that are afraid of large dogs should simply avoid taxpayer-funded Teegarden Park? Should we also avoid Chester Valley Trail? There will be a fence installed that separates the playgrounds d from the area where dog are allowed off leash. Judy, thank you for this information. Will the playground be fenced so the dogs cannot get inside? When will this happen and is the fence project a township project or will it be done by Friends of Teegarden. Appreciate any additional information that you can provide. I live close to Mill Road Park and stopped by today (Sunday afternoon) — interesting that although the park signage clearly states “no dogs off leash”, I counted 11 large dogs off leash on the sports fields and only one beautiful little black Scottie dog on a leash. I wonder if these dog owners bring their animals to Mill Road Park so as to avoid the $25 application fee at Teegarden. According to the township leash law policy, the fine could be as high as $1,000 to the dog owner if a dog is off-lease where it is not permitted. Mill Road Park is across the road from the Tredyffrin Township Police Dept, so would think this is risky on the part of dog owners. Too many dog owners feel they do not need to obey leash laws and/or that their dogs should be entitled to run free. Are my taxes going to underwrite the cost of enforcement in our public parks? I wasn’t speaking specifically to Tea Garden Park, but your article just states you are not in favor of leash-free parks without providing any alternative area or park. I don’t know that putting a leash-free park next to a playground is necessarily a good idea. Chester Valley Trail & Wilson Farm Park are NOT leash- free and pets should be leashed there. That is a different issue. But places like the Lorimer Preserve on N. Valley Rd. or Mill Rd. Park at the sections at the top of the hills are perfect to be leash-free. They are fairly contained with no cyclists, tennis courts or playgrounds in sight. Dog owners are also taxpayers. Surrounding townships, i.e. Radnor, Willistown or Upper Merion have NO problem with providing one decent leash-free park. Only TE always seems to either rule them out or load them up with so much red tape. Visit Harford Park in Radnor and see the joy. Why can’t Tredyffrin residents have a park like that somewhere in the township? To be clear, I said that I “do not support the idea of off-leash dogs in public places – unless they are in a fenced pet area.” If Tredyffrin Township had a public park that was entirely leash-free and advertised as such (without playground, picnic area, sports fields, tennis courts, etc.) than I would be OK with that in lieu of fenced area. Mill Road Park is not a designated off-leash township park; all dogs are to be leashed. As for the Lorimer Preserve, this property is not owned by Tredyffrin Township and is not a public park. Lorimer Preserve is part of the Open Land Conservancy, a registered nonprofit organization, http://www.openlandconservancy.org Although the public is welcome to enjoy the Open Land Conservancy properties (including Lorimer) their website states that “Dogs must be leashed” and asks visitors to “Please pick up after your dogs to keep the trails clear for all walkers”. So although you may think Lorimer Preserve is “perfect to be leash-free”, the board of Open Land Conservancy feels differently. I thank you for your comment and opportunity to respond. Thank you, Pattye, for clarifying the private ownership of the Lorimer Nature Preserve and the policies that apply there and in all Open Land Conservancy’s Nature Preserves. 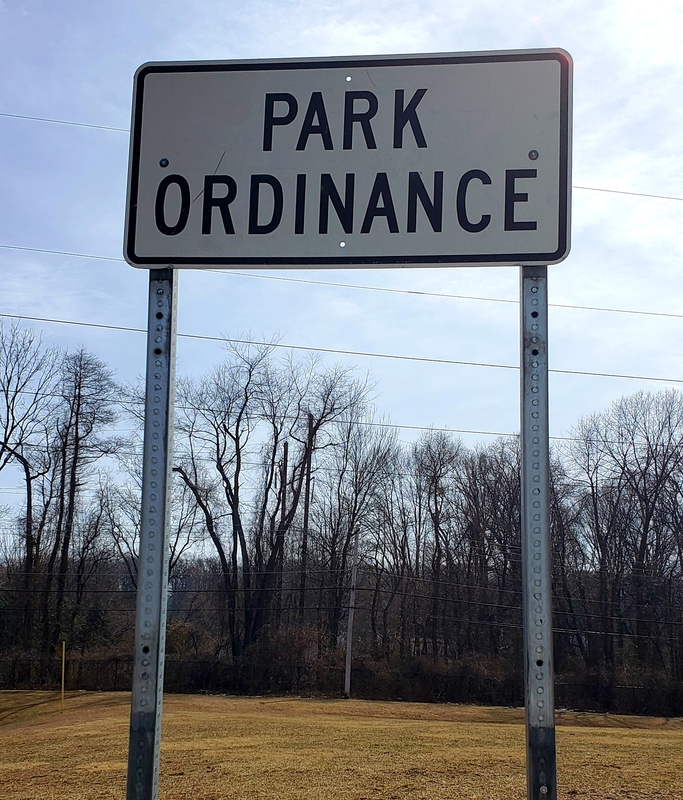 The Conservancy owns rare and wonderful open space here in Tredyffrin that we encourage everyone to enjoy safely, and we welcome dog owners equipped to abide by our own and the Township regulations. 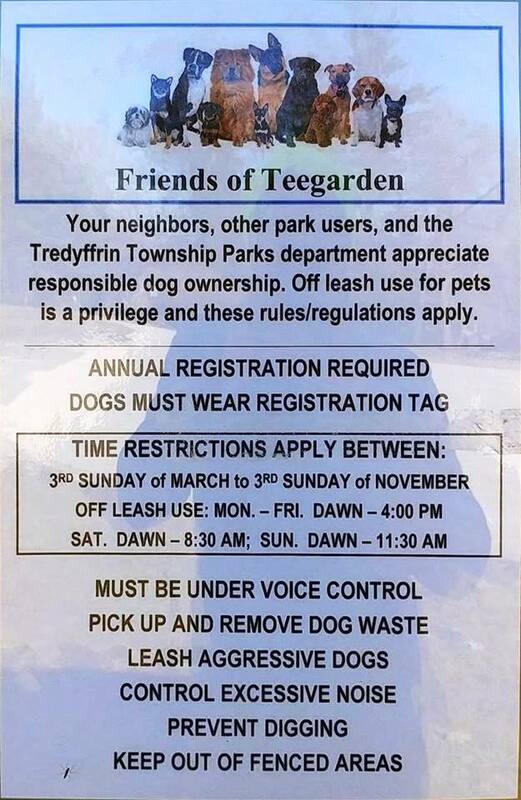 As with all private property, visitors must have their dogs leashed at all times, as provided by Tredyffrin ordinance 131-1(G). We are sure that CM readers will understand that such a regulation is especially important for a Nature Preserve that is open to the public, where there is a duty to protect both the wildlife and its habitat and also our visitors. The all-volunteer Conservancy takes these obligations very seriously and we are fortunate to receive outstanding support from Tredyffrin Police in pursuing serial violators recorded on our camera network. The sign right at the entrance to the Lorimer Preserve has both words and a picture to make the leash requirement clear. Brandywine Conservancy’s Waterloo Mills Preserve in Easttown bans dogs altogether – and that is a route we do not want to take..
Any person who violates or permits a violation shall be guilty of a summary violation and, upon conviction, shall be sentenced to pay a fine of not more than $1,000, plus all court costs, including reasonable attorneys’ fees, incurred by the Township. Each day a violation exists shall constitute a separate offense. In default of the payment of any fine, the defendant shall be sentenced to imprisonment to the extent allowed by law for the punishment of summary offenses. Further, the appropriate officers or agents of the Township are hereby authorized to seek any other available relief at law or equity, including injunction, to enforce compliance. I think your childhood experience was very traumatic and you are still suffering the repercussions. I greatly sympathize with your distress and understand how debilitating it must be with so many pets and dogs in the community. My friend has had much success with therapy to overcome similar fears and post-traumatic stress syndrome. I wish you much success and hope you are getting support and help. I will pray for you. Although I appreciate your comment Cherly, I really am OK with dogs — as I mentioned I had a Shih-zu for 13 years (and before that we enjoyed other family dogs — another Shih-zu and a Lhasa Apso). The problem I have is when dogs are “off leash” in public areas that require dogs be leashed, such as Chester Valley Trail and Mill Road Park. And although I appreciate that Teegarden Park legally allows dogs to run off-leash, it assumes certain policies are followed and it is unclear how those are enforced. Teegarden Park needs to be safe for all residents, including those who wish to use the playground and picnic areas. Almost every dog I’ve ever seen at Mill Road is off leash. And with soccer, lacrosse and baseball happening there are people around there a lot. I have personally had multiple run ins with dogs there while running as my kids were practicing. Just cause your dog is “friendly” and “will lick you to death” isn’t the point people. Dogs should be on a leash. Would like to see some better pick up after the dogs as well. Kids play baseball on TeeGarden #4 around those land mines. A couple of issues are important to review when a public park is deemed a Tredyffrin “off leash” dog park. 1.The issue of “in control” of your dog(s) should be defined. 2.The idea of a fenced in area for dogs is another idea to decrease the probability of dogs running into parking lots. 3.The third issue is educating the dog owners and the public. I am a animal lawyer in full support of animal rights and animal welfare. I own a rescue dog from the Chester County SPCA. I believe these “sentient beings” should be protected as more than “property” like a basic table or chair under the law. I appeal to all animal owners to protect their animals as they would protect themselves from harm. A responsible human companion is always paying attention to their dog and within a short distance from their dog to observe their dog’s interaction in the “pack”. If a dog fight breaks out for any reason what would you do? If your dog accidentally knocks down a person? If your do bites another dog or person? I offer help and I take responsibility. Please be kind and considerate. I live in a neighborhood with responsible, considerate neighbors who always walk their dogs on a leash. I have been bitten twice by leashed dogs I chose to approach and try to pet. The owners were just as stunned as me when blood started dripping down my leg and finger respectively. Owners are incredibly bias towards their dogs and in both cases blamed me explaining that my clothing scared the dog and in the second case, the dog was a puppy and didnt know better. Both dogs are still aggressive and I stay away. Owners will always say their animals are friendly because they probably are to their owner. A dogs, any dogs behavior cannot be predicted or guaranteed. Even when a dog is leashed, citizens should be careful and approach with caution no matter what the owner says. Dogs should be leashed at all times.